When working with financial transactions, we often want to analyse them between our financial periods rather than just calendar months. This is pretty easy if your financial year is January to December and your periods are the calendar months, but what if your year starts in April or you have four and five week periods - or both? I'll explain how to address each of these scenarios in this post. In each case, let us assume the date we want to identify the period for is held in cell A2. This is by far the simplest scenario as we can use the MONTH function to strip the month number from the date, so =MONTH(A2) will do the trick, returning 1 for January, 2 for February, etc. This situation is slightly more complicated but we can use our knowledge of the IF function to address it, along with the MONTH function used above. 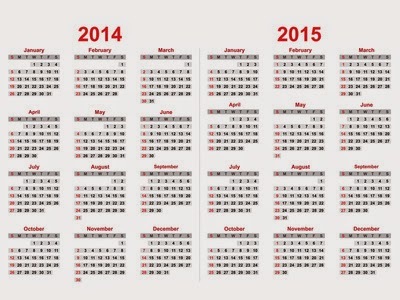 Let's say our year end is March So the calendar month 4, is our period 1. So deducting 3 from the month will give us our period, however this will only work from April onwards. If our date is in February and we deduct 3 from the month, we will have -1, rather 11, which is what we require. This is where the IF statement comes in. If the month is greater than 3, then we want to deduct 3, otherwise we want to add 9 (which is 12 -3). For this situation, we need to take a different approach. We don't have a simple rule for the periods, so we will need to tell the spreadsheet them. We can do this with a LOOKUP table. We should have a two-column table with the first column for the start date of each period (earliest to latest), and the second column for the period number. We can then use VLOOKUP with a TRUE (or omitted) fourth argument to look up the correct period. =VLOOKUP(A2,$D$2:$E$13,2) will return the period number. I have applied the dollar signs to the range so that it stays fixed when copied to other rows. This last approach is obviously the most flexible and can be used for many other scenarios, e.g. identifying VAT quarters for example. However the above does group the last few days of the year (30th 31st Dec etc) in to the last week of the last period, and this didn't quite work for me as the company I worked for would rather have the last week of the year a partial week and the new week started on the 1st monday of the month rather than the 1st Jan.
Andy, some impressive stuff there for calculating a 4-4-5 periods. As you can see in the post, I suggest the lookup option when it gets this complicated, but you still need to work out what the period-ends should be to enter into the lookup table! NOW, OUR FINANCIAL YEAR STARTS ON 31 JULY AND ENDS ON 30TH JUNE EVERY YEAR. PLSE, GIVE US A RIGHT FORMULA. I presume you mean that the year starts on 1st July, or you would only have 11 months! Assuming this is the case, the example for non-calendar year with calendar months applies. i.e.